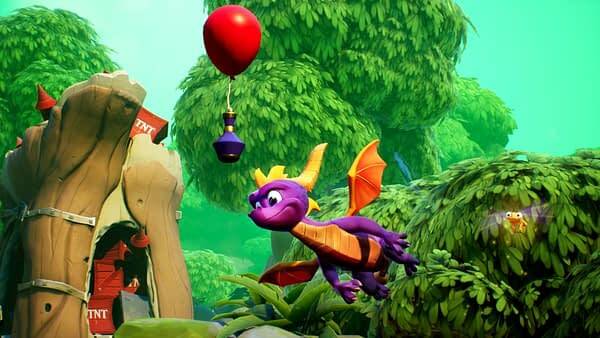 Activision has released a brand-new gameplay trailer for their upcoming Spyro remake, the Spyro Reignited Trilogy. Today’s video includes gameplay from Hurricos, which is one of the realms included in 1999’s Spyro 2: Ripto’s Rage! — so it should look pretty familiar. The video shows off the new graphics, which manage to maintain the charm and cartoon quality of the original trilogy while still looking pretty damn awesome in higher resolutions. The graphics also include new lighting and visual effects to create dynamic lighting around the diodes and force fields of the Hurricos area. You can also note the living quality of the grass as well, as it sways gently with shifting shadows that give it a proper three-dimensional feel. Even Spyro’s flame breath has some new current-gen qualities to it that makes it look much more impressive than the 1999 edition. That said, all of the character designs and UI really do remain faithful to the original just with new details and dimensions. So this looks like one remake done exactly the way fans want it — the same basic experience, with a few quality of light improvements, and far better graphic fidelity. Spyro Reignited Trilogy will release for PS4 and Xbox One on September 21st, 2018. You can check out the new trailer below.